The 10ft Red Sky Dancer attachment is an inflatable advertising product that will catch the eye of your patrons with it's dancing and waving, enticing them to visit your business or event. For those who want the same impact as our classic 20ft Red Sky Dancer but in a compact size, the 10ft height and attractive color and face is ideal for space restricted areas and will attract much needed traffic. 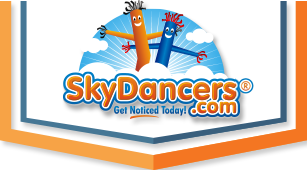 Stay ahead of the competition by purchasing an inflatable advertising product from Skydancers.com. Sky Dancers from SkyDancers.com is the inflatable advertising product that people have grown to trust. Diameter of Sky Dancer is 12"
Amazing dancing guy! Our customers love it, our employees think it's hilarious, and I honestly think it gets more customers in our door. We have gotten more comments on this Air Dancer than any other sign or promo we've ever done. I'll report back after a couple months.